Pond liners play a vital role in the containment of water in ponds particularly where soil is porous. There are two main types of pond liners, namely preformed and flat sheet liners. Preformed liners are made from a high density polyethylene moulded into fixed shapes. To install a preformed pond, a hole is dug to the deepest depth and widest length of the mould. The preformed pond is then gently lowered into the hole and back filled with sand to secure it in place. Ensure it is level and flush with the ground surface. Flat sheet pond liners can be easily shaped to fit the unique contours of any pond design. A preformed pond is guaranteed to last around fifteen years relative to a flat sheet liner which, if installation guidelines are adhered to, are guaranteed to last at 25 years or more. The use of pond liners is probably the easiest, quickest and most cost effective way to achieve a stunning water feature. The flexibility of flat sheet pond liners allows you the freedom to design a pond that suits your requirements. A flexible pond liner versus installing a preformed liner also offers the opportunity to add on additional features such as a stream or linking two ponds together. PVC pond liner is ideal for small, basic ornamental garden ponds. However, for larger more demanding applications, rubber pond liners, such as Butyl or Epaly (EPDM) are more suitable. Butyl pond liners can withstand the severity of both frost and UV radiation. Although thicker than the PVC, Butyl is still remarkably flexible and easy to use. Butyl is suitable for larger installations due to its tougher qualities. Butyl can also be welded on site using a portable hot bonding machine. Epalyn rubber pond liners are more rugged than PVC. They are better for cool climates and have superior UV resistance. Epalyn liners have high expansion and contraction characteristics that enable it to conform to objects below the pond. Should earth movement occur, such as settling, Epalyn high elongation properties will enable it to stretch. Epalyn can be obtained in various”grades” (thicknesses). The flexibility of rubber and PVC allows for more versatility in the pond design. Epalyn requires little or no regular maintenance once installed. Epalyn (EPDM) has a remarkable resistance to the harmful effects of ultraviolet radiation (UV), ozone and other environmental conditions. Pond liners are guaranteed for 25 years or more when installed above a protective underlay. Geotextile underlay acts as cushioning material between the liner and the surface of your pond excavation. Liners Online specialise in supplying superior quality pond liners and protective pond underlay directly to customers. Pond liners Epalyn (an EPDM liner), Butyl and PVC are supplied. Rubber liners are recommended as they are more durable, flexible, moderately inexpensive and easy to work with. 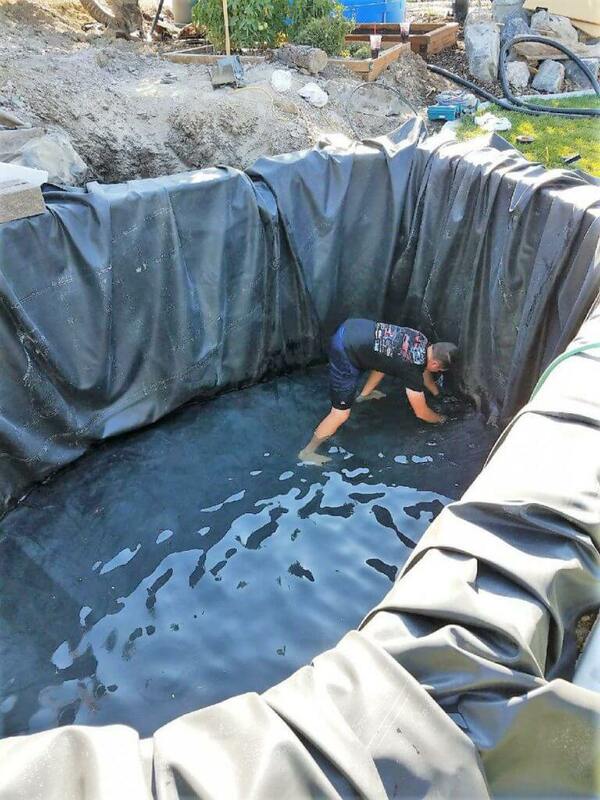 Want to buy a flexible pond liner? Visit our website, select the pond liner material required and add the dimensions to your order. The pond liner size and price is calculated before proceeding to checkout. -shaped, has an island or a plinth, please do not use the calculator but Contact Us to discuss the pond liner dimensions required. Please note: PVC can be ordered to a minimum width of 2m and maximum of 10 meters wide and 25 meters in length. When calculating pond liner dimensions the width must be rounded up to the nearest whole number and length to the nearest half. There are no restrictions to Epalyn and Butyl pond liner orders.